SIGNAL HILL, Calif. /California Newswire/ — Food Finders, Inc. is pleased to announce it is a recipient of Neotrope's 2013 J.L. Simmons NonProfit PR Grant award. With this commitment, Neotrope(R) will assist with Food Finders' mission to redistribute food donated by the regional hospitality industry and local grocers to feed those who are food insecure. "Food Finders is a multi-regional nonprofit organization with a mission to eliminate hunger in our local communities," shared Patti Larson, Executive Director of Food Finders, Inc. in Signal Hill, Calif. "Neotrope/Send2Press will support our effort to increase awareness of what we do, encouraging community businesses such as hotels, caterers, banquet rooms, restaurants and more – along with local residents – to ensure that no food gets wasted, but rather donated to feed those less fortunate." Food Finders is celebrating an important milestone this year. As of April of this year, Food Finders has reached a "100 million pounds of food rescued" milestone; meaning, since 1989, the nonprofit has received 100 million pounds of food donated and redistributed to feed those who are food insecure. 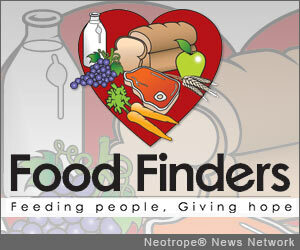 April also coincides with Food Finder's 24th Anniversary of doing food rescue/hunger relief. "We're excited to hit that mark, and are on goal to collect 7.3 million pounds of food in 2013," adds Larson. As part of this in-kind grant program, Neotrope is providing public relations (PR) solutions, news dissemination (through its Send2Press(R) Newswire service), online advertising, and social media marketing for Food Finders, Inc. This program is intended to help raise awareness of the 501(c)3 non-profit to traditional media, to the public, as well as potential sponsors and donors, regarding their efforts in distributing food directly to more than 200 missions, shelters and social service agencies to feed the needy and impoverished. "We're honored in providing assistance for Food Finders," said Neotrope CEO, Christopher Laird Simmons; a member of PRSA and ASCAP. "Their efforts fill a notable need in local communities where daily hunger is still a desperate problem for some, and not just the homeless. Food Finders uses the term 'food insecure' and this need can equally apply to families who are 'under employed' which is a growing segment of the U.S. population not being well addressed by the Federal or State agencies. Food Finders' mission is one of the most admirable in finding and rescuing food to redistribute to those needing it most, and we truly look forward to helping them raise awareness and engagement for their efforts." With this grant program, Neotrope has been honored to help many worthy causes in past years, including Camp Blue Skies, Children Awaiting Parents, Fresh Start Surgical Gifts, Girls Write Now, Move for Hunger, The Native Voices Foundation, The Pacific Pinball Museum, The Bob Moog Foundation, Special Equestrians, Starlight Children's Foundation, World Savvy and dozens more. Send2Press(R) (a service of Neotrope) offers best-in-class affordable Direct-to-Editors(TM) news distribution to working print and broadcast media, to social media, with high visibility in search engines using proprietary Neotrope ContextEngine(TM) technology. Send2Press is unique because it was the first newswire service with staff entirely comprised of accredited public relations professionals, published authors, working journalists, and marketing experts. The service was spun-off of Neotrope's traditional PR services in 1999. Learn more about Send2Press at http://www.Send2Press.com/ .